Award winning punk-jazz ensemble WorldService Project (WSP) have featured on national radio stations in the UK, Portugal, Germany, Denmark and Sweden and their intense live sound has taken numerous European cities and festivals by storm including the London Jazz Festival, Tampere Jazz Happening (Finland), Umea Jazz Festival (Sweden), Ljubljana Jazz Festival, 12 Points Festival (Porto), Brecon, Marsden and Swanage Jazz Festivals, Europe Day (Dublin), WDR Funkhaus (Cologne), and Match&Fuse double-headers taking in Italy, Norway, Germany, France and Ireland. 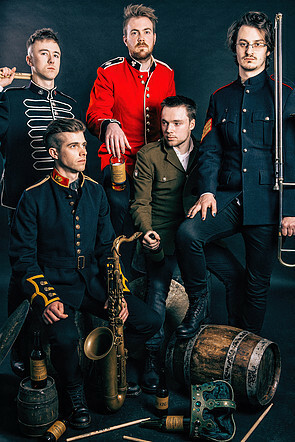 The London based unit are described by Time Out London as “…dazzling…big things lie ahead for them”, their music described as “brilliant post-prog funk” (Jazzwise), “tight, deftly structured and grittily grooving music…” (The Guardian) and “serious skronk-jazz” (The Telegraph). In essence, imagine a (loud!) four-way cage match between Frank Zappa, Loose Tubes, Stravinsky and Meshuggah. The result is high-octane experimental but accessible music with a smile on its face. WSP spent much of 2016-17 touring their new album ‘For King and Country’ (produced by Chris Sharkey), completing trips to Germany (Freakshow Festival, Wurzburg), Toulouse (Match&Fuse festival), China and Japan (Tokyo Jazz Festival and Jazz Art Sengawa Festival) and India (Goa International Jazz Festival). 2018 will see them tour their fourth album, ‘Serve’, produced by Liran Donin, throughout Europe, India and China.